Nationality: American. Born: Robert Charles Duran Mitchum in Bridgeport, Connecticut, 6 August 1917. Education: Attended Haaren High School, New York, left at age 14. Military Service: U.S. Army, 1945. Family: Married Dorothy Spence, 1940, three children, including the actor Christopher. Career: Worked at a variety of jobs during the 1930s, including heavyweight boxing; joined Long Beach Civic Theatre as stage hand and actor in late 1930s, and worked for Lockheed Aircraft in early 1940s; 1943—film debut in Hoppy Serves a Writ ; 1944—contract with RKO, later shared with David O. Selznick, then bought by Howard Hughes; 1945—starring role in G.I. Joe ; 1948—well-publicized arrest for possession of marijuana; 1954—formed own production company, DRM Productions, later changed to Talbot Productions; 1980—in TV mini-series The Winds of War , North and South , 1985, and War and Remembrance , 1988; 1990—in TV series A Family for Joe . Died: 1 July 1997, in Santa Barbara, California, of lung cancer. Interview with B. Rehfield, in Esquire (New York), February 1983. Interviews in Photoplay (London), November 1983 and February 1985. Interview in Films (London), November 1984. Interview in Talking Films: The Best of the Guardian Film Lectures , edited by Andrew Britton, London, 1991. Interview with Graham Fuller, in Interview (New York), December 1991. "Mitchum Russell," interview with Harlan Kennedy and Gerald Peary, in Film Comment (New York), July/August 1992. "Rule 7: Remember the Advice of a Survivor," interview with David Freeman, in Los Angeles Magazine , October 1995. Tomkies, Mike, The Robert Mitchum Story , Chicago, 1972. Belton, John, Robert Mitchum , New York, 1976. Marill, Alvin H., Robert Mitchum on the Screen , South Brunswick, New Jersey, 1978. Eells, George, Robert Mitchum , New York, 1984. Malcolm, Derek, Robert Mitchum , Tunbridge Wells, Kent, 1984. Downing, David, Robert Mitchum , London, 1985. Mitchum, John, Them Ornery Mitchum Boys: The Adventures of John and Robert Mitchum , Pacifica, California, 1989. Crowther, Bruce, The Film Career of Robert Mitchum , London, 1991. Roberts, Jerry Wayne, Robert Mitchum: A Bio-Bibliography , Westport, Connecticut, 1992. Marill, Alvin H., The Films of Robert Mitchum , Secaucus, New Jersey, 1995. Ringgold, Gene, "Robert Mitchum," in Films in Review (New York), May 1964. Current Biography 1970 , New York, 1970. Chevalier, J., "Une Fleur pour Bob Mitchum, le rebelle d'Hollywood," in Ecran (Paris), December 1975. Ebert, Roger, "Robert Mitchum," in The Movie Star , edited by Elisabeth Weis, New York, 1981. Ward, R., "Mr. Bad Taste and Trouble Himself: Robert Mitchum," in Rolling Stone (New York), 3 March 1983. Thompson, Frank, "Robert Mitchum: The Original Mr. Attitude Can Act as Well as He Wants," in American Film (New York), May 1991. Filmography in Premiere (New York), November 1991. "Hot Icon: Robert Mitchum," in Rolling Stone (New York), 14 May 1992. Slide, A., "The Slide Area Film Book Notes," in Classic Images (Muscatine), January 1993. Radio Times (London), 8 October 1994. Svehla, G.J., "Robert Mitchum's Cinema of Evil: 'Cape Fear' & 'Night of the Hunter," in Midnight Marquee (Baltimore), Winter 1994. Farber, S., "Robert Mitchum in 'Night of the Hunter'," in Movieline (Escondido), July 1995. "Do You Want to Write a Screenplay for Robert Mitchum?" in Written By (Los Angeles), December/January 1996/97. Cahiers du Cinéma (Paris), May 1996. Parkinson, David, "Tough Guy With a Tender Heart," in Radio Times (London), 19 July 1997. Obituary, in Time Out (London), 6 July 1997. Obituary, in Variety (New York), 14 July 1997. Obituary, in Cahiers du Cinéma (Paris), July-August 1997. Obituary, in EPD Film (Frankfurt/Main), August 1997. Gross, Larry, "Baby, I Don't Care," in Sight & Sound (London), September 1997. Obituary, in Skrien (Amsterdam), September 1997. Jarmusch, Jim., "Un million de dollars de crottin," in Cahiers du Cinéma (Paris), September 1997. Cieutat, Michel, "Robert Mitchum 1917–1997: Le phénomène de l'invisible," obituary in, Positif (Paris), November 1997. Whether due to natural modesty or shrewdness, Robert Mitchum has cultivated an image as Hollywood's I Don't Care Boy. A self-proclaimed graduate of the I-Just-Show-Up-and-Read-My-Lines School of Acting, Mitchum presents the media and his devotees with a portrait of himself as a no-nonsense underachiever who lucked into his career. For a man whose first minor break come when he volunteered to ride a horse that had just killed another bit player, the truth about his casual attitude might be complex enough for the kind of treatment Kurosawa gave Rashomon . Brimming with the sort of he-man sexuality that swept away women's better judgment, Mitchum might have been stuck playing muscle-bound rascals if he had come to prominence sooner, but his ascendancy coincided with the postwar turmoil encapsulated in film noir. A man of few words, all of them packed with dynamite, the terse Mitchum was a minimalist actor; since he did not call attention to himself with Oscar-grabbing flourishes, his economical methods make his cleanly delivered performances seem all the more modern today. Winning his first and only Oscar nomination for The Story of G.I. Joe , Mitchum always had the luxury of alternating hero and villain roles as he effortlessly changed his wardrobe from leather chaps to soldier fatigue to P.I. trench coat, with an innate fashion sense of what the well-dressed antihero wore. Never letting up with his official line about not taking his career seriously, Mitchum outlasted his more highly regarded contemporaries until he was the last Golden Age male superstar still billed above the title. At the time when he was RKO's resident screwed-over everyman, his notorious drug bust actually enhanced his reputation by jazzing up his social outlaw image. Ingrid Bergman, Tom Neal, Rory Calhoun and many others were not so fortunate in an era when Confidential magazine began invading stars' homes to look for skeletons in their closets. Perpetuating his persona as a frontiersman with a past ( Rachel and the Stranger , Blood on the Moon ), Mitchum brought an equally haunted quality to bear on RKO's other genre staple, the fatalistic urban thriller in which Mitchum hinted that resignation to corruption was often an antihero's only recourse. If Out of the Past engraves the tough, soul-sick Mitchum image in stone, his other RKO standouts hint at something more sinister than entrapment in a cycle of crime. What is endlessly fascinating about movies such as Angel Face , The Locket , Where Danger Lives , and My Foolish Past is that the solidly built male star at the center of these whirlpools is primarily a fall guy for women. In the provocative Angel Face , Mitchum is the heterosexual's worst nightmare, a man of action turned impotent by a controlling beauty. 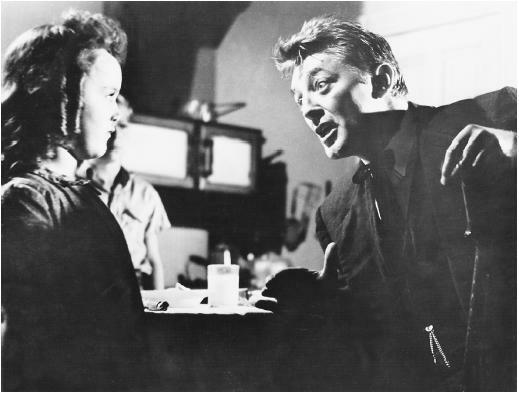 Less perilously paired with Jane Russell in a series of robust adventures, Mitchum's lighter side received a workout, but he continued adding to his star luster with straightforward leading-man roles opposite Deborah Kerr, Marilyn Monroe, and others, in exciting romantic films that explored his good-natured skepticism while exercising his broad appeal to men and women. In the course of easing into his own played-down legend, Mitchum broadened his range with subtle turns in sophisticated misfires such as Secret Ceremony , singlehandedly salvaged the epic Ryan's Daughter with his quiet authority, and brought heartbreaking purity to bear on his portrayal of an Australian sheep farmer cursed with wanderlust but blessed with Deborah Kerr in The Sundowners . Knocking the socks off even his admirers, Mitchum also made chilled-to-the-marrow moviegoers shudder with his interpretations of rotten villains in Cape Fear and The Night of the Hunter . The former is a taut psycho-thriller about a sadist conversant with legal technicalities; Mitchum fashions a stalker monster clearly ahead of his time—an achievement all the more impressive since critics-darling Robert De Niro failed to outdo Mitchum in the dreadful Scorcese remake. Even finer is Mitchum's venal bible-thumper in The Night of the Hunter , Charles Laughton's expressionist fairy tale now regarded as a horror classic. If these two performances do not clinch the argument that Mitchum is a great screen actor then the definition of great screen acting needs to be modified. Late in his career, Mitchum's seen-it-all wariness and offhanded gallantry redefined forties detective iconography for contemporary times with Farewell, My Lovely . In a fitting career capstone, the miniseries The Winds of War and War and Remembrance consolidated Mitchum's position as one of Hollywood's durable icons. It is fortunate that Mitchum endured to receive accolades for a body of work that he consistently undervalued. Somewhere behind those heavy-lidded eyes and are-you-kidding exterior, Mitchum have felt secretly vindicated. Although filmgoers have enjoyed this late bloomer's laconic presence for years, the critical and popular consensus has finally caught up with Mitchum's greatness as a screen star.